“There is no place I’ve ever heard of like it. A band of wineries and growers located on the westernmost, coastal part of the Sonoma Coast American Viticultural Area (AVA) have joined this year to form the West Sonoma Coast Vintners (WSCV) Association. These West County Pinot Noir producers have longed to distinguish themselves from the more inland portion of the vast Sonoma Coast region which is a distinctly different environ. The WSCV is composed of West Sonoma Coast vintners and growers as well as wineries outside the region that source grapes from the area. 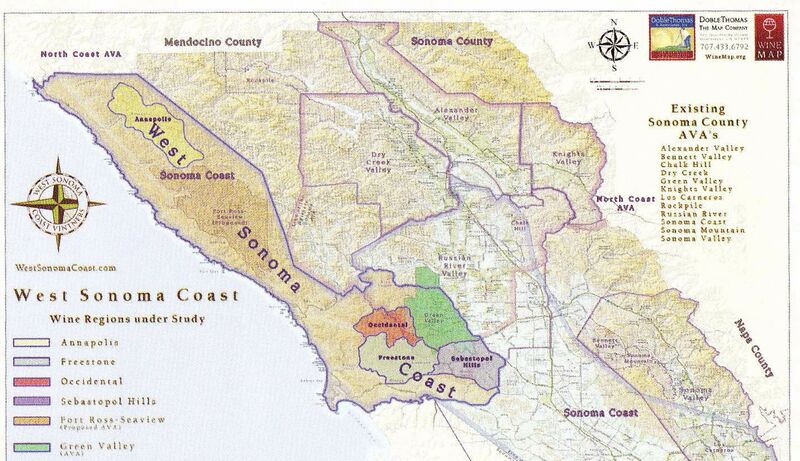 The Sonoma Coast AVA is the largest of the thirteen AVAs in Sonoma County at 750 square miles or 517,000 acres, nearly half of Sonoma County. John Winthrop Haeger points out this is larger than the size of Burgundy including Chablis, the Côte d’Or, the Côte Chalonnaise, and the Maconnais. This cumbersome AVA was formed in 1987 primarily because of the wishes of Sonoma-Cutrer Vineyards, which wanted to include all their scattered major vineyards in one boundary so they could use the “estate bottled” designation on their wine labels. The Sonoma Coast AVA is denoted as the large western light green area on the map below. The vast Sonoma Coast AVA extends from the Sonoma County border with Napa in Carneros bordering on San Pablo Bay to Marin County and the Pacific Ocean 30 miles to the West, progressing north through Sonoma County and reaching its most northern limits at the Mendocino County border. 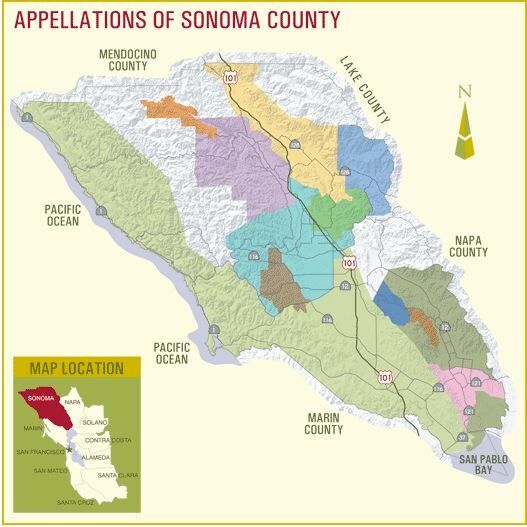 It overlaps five other Sonoma County AVAs including the Sonoma part of Carneros, a sliver of Sonoma Valley, the western part of Chalk Hill, all of Green Valley (brown), and most of the Russian River Valley (turquoise). The Sonoma Coast AVA is defined by its coolness, with no more than 2,800 degree days of heat during the growing season, and most areas classified as Region I with less than 2,500 degree-days to ripen grapes. The amount of “coolness” varies greatly within the AVA with the most northwesterly portion known as the West Sonoma Coast being significantly colder because the vineyards are located in close proximity to the Pacific Ocean. 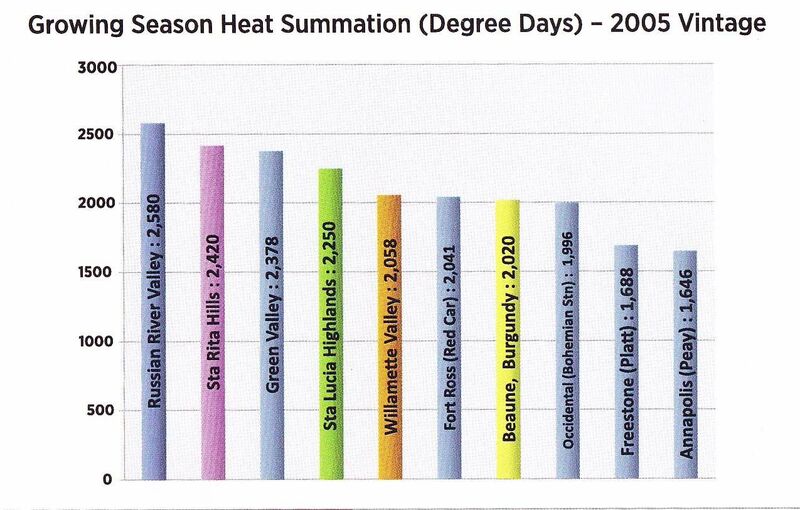 The growing season heat summation in degree days for major Pinot Noir growing regions in California, the Willamette Valley of Oregon, and Beaune in Burgundy are contrasted for the 2005 vintage in the graph below. Clearly, the areas of Fort Ross, Occidental, Freestone, and Annapolis in the West Sonoma Coast are significantly cooler. 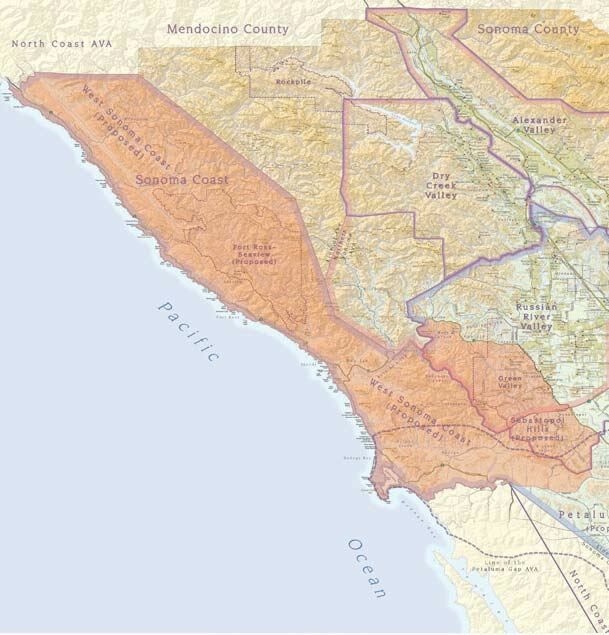 Because of the unwieldy immensity of the Sonoma Coast AVA, it has been unofficially subdivided into the West Sonoma Coast, which makes up about 10% of the entire AVA. A number of names have evolved in recent years including “far,” “true” and “real.” True Sonoma Coast is a term which Ted Lemon and others have adopted, but the members of the WSCV, including Ted, have wisely chosen not to continue to use this term. Preferably, the region should be addressed as West Sonoma Coast, Sonoma Coast West, or possibly, the “extreme” Sonoma Coast. The West Sonoma Coast subdivision extends roughly from Jenner in the South where the Russian River empties into the Pacific Ocean to Annapolis in the North and from the beaches to 5 to 12 miles inland including the first three ridges of the Coastal Range of mountains, extending more easterly in the South to include Freestone, Occidental, Green Valley and Sebastopol Hills where the coastal ridges flatten out (refer to map below). The biggest challenge facing vintners and growers in West Sonoma County is unprofitably small yields. 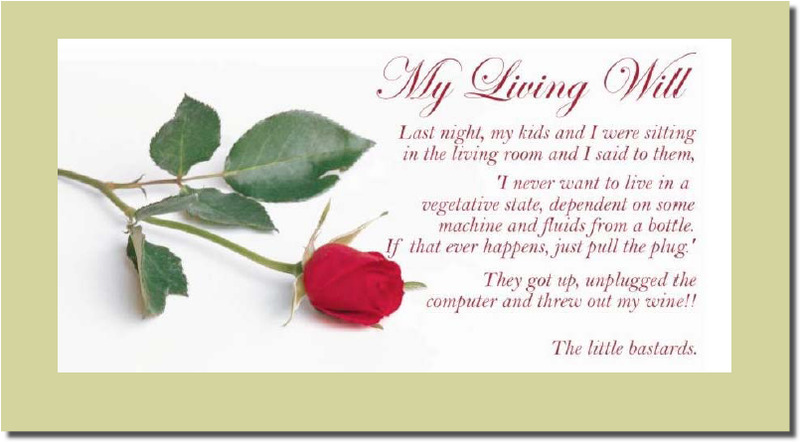 Crops can be very small depending on the vintage and farming is not for the faint of heart. In 2005, for example, some vineyards were devastated by rain during bloom leading to poor fruit set and yields in these vineyards was less than 1/2 ton per acre and in some cases no usable grapes were harvested. Mike Bohan was the first to plant grapes in the West Sonoma Coast. In 1971, he developed a 1,400 foot ridge top vineyard in remote Cazadero on Bohan Dillon Road. Initially planted to Zinfandel, the vineyard came to include Chardonnay, Riesling and Pinot Noir. To this day, the Bohan Ranch sells all of its grapes. 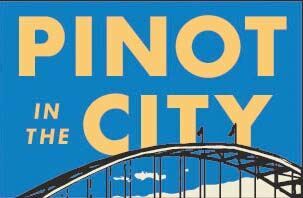 A number of others soon established Pinot Noir plantings in Cazadero including Donnie and Linden Schatzberg (Precious Mountain Vineyard), Daniel Schoenfeld (Wild Hog Vineyard), Dan Wiekham (Sea Ridge) and most notably, David Hirsch (Hirsch Vineyard). David Hirsch was a visionary whose Hirsch Vineyard has become synonymous with the Sonoma Coast. His remote vineyard on a high ridge overlooking the Pacific Ocean was first planted in 1978. At the time, it was crazy to think that one could make a living growing Pinot Noir in this inhospitable region. In 1994, Ted Lemon (Littorai), Burt Williams (Williams Selyem) and Steve Kistler (Kistler Vineyards) visited Hirsch Vineyard and became the first and most important purchasers of Hirsch Vineyard fruit. Today, Hirsch’s vines are among the few mature plantings of French clone Pinot Noir in California. Hirsch Vineyard is pictured from the air below. The list of ensuing vintners who flocked to the West Sonoma Coast reads like a who’s who of California Pinot Noir. The names include Helen Turley and John Wetlaufer (Marcassin), Lee Martinelli (Martinelli), Bill Smith (W.H. Smith), Ted Lemon (Littorai), Walt and Joan Flowers (former owners of Flowers Winery), Mark Bixler and Steve Kistler (Kistler Vineyards), Jason Pahlmeyer (Pahlmeyer), Peter Michael (Peter Michael), Mike Benziger (Benziger), Anne-Marie Failla and Ehren Jordan (Failla), Joseph Phelps (Freestone Vineyards), Nick Peay and Vanessa Wong (Peay Vineyards), Carroll Kemp (Red Car), Dan Goldfield (Dutton-Goldfield), Thomas Brown (Rivers-Marie), Kent Humphrey (Eric Kent), Marimar Torres (Marimar Estate), Joseph Wagner (Belle Glos), Ross Cobb (Cobb Wines), Anthony Austin (Sonoma Coast Vineyards), Bryce Jones (Emeritus), Ken and Akiko Freeman (Freeman Vineyards), Greg La Follette (La Follette Wines) Ross Halleck (Halleck Vineyards) and Fort Ross Vineyards & Winery, Kendall-Jackson, Hartford Court, and Roessler Cellars. Developing vineyards in the West Sonoma Coast presents a number of challenges including the remoteness of the region, the small areas suitable for planting, and the opposition from local residents and conservationists. The Preservation Ranch vineyard and timber conversion plan has been in the news of late. The project is the largest timberland conversion ever proposed in Sonoma County and would consist of 1,800 acres of vineyards on 20,000 acres of land in the Annapolis area. Premier Pacific Vineyards is the developer and is required to do an extensive environmental impact report including the determination of how much carbon is released into the atmosphere and stored in the soil, the generation of greenhouses gases, the water impact and public benefits and costs. The Sierra Club opposes the project, claiming that the land should remain a forest. Opponents have organized under the Friends of Gualala River banner which includes the local Pomo Indians. The final ruling by the Sonoma County Board of Supervisors is pending and will be closely watched as their decision will set a precedent for future large scale development in the West Sonoma Coast. The entire Sonoma Coast AVA, with over 7,000 acres of vineyards, dwarfs the over 600 acres found in the West Sonoma Coast (I could not find current or recent vineyard acreage for West Sonoma Coast. John Winthrop Haeger in North American Pinot Noir reported the vineyard acreage as 600 acres in the 2004 edition of his book. Vineyard plantings have been ongoing since then so the number is probably a few hundred acres higher). Most of the West Sonoma Coast plantings are Pinot Noir. The West Sonoma Coast has few wineries (Annapolis, Flowers, Freeman, Freestone, Hirsch, Littorai, and Marimar Estate) but over fifty growers overseeing mostly small vineyard plantings except Kendall-Jackson which has a large planting, of 300 acres on a 600-acre parcel on Skaggs Springs Road near the hamlet of Annapolis. West Sonoma Coast has been further subdivided into six subregions that are so dramatically different that they warrant further study. These include from north to south, Annapolis, Freestone, Occidental, Sebastopol Hills, Fort Ross-Seaview, and Green Valley. 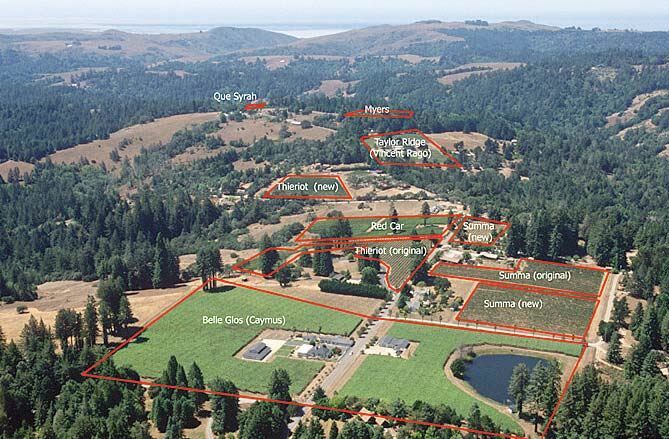 A Fort Ross-Seaview AVA proposal was spearheaded by David Hirsch in 2003 but defeated by opposition from Brice Jones of Emeritus and Hartford Family Winery, among others, who had vineyards outside the proposed smaller AVA. Ted Lemon points out that this is a highly diverse and complex region and there is much to be learned about the proposed sub-regions. Ted has emphasized, “The entire area is too complex to speak in generalities.” One of the stated purposes of the WSCV is to foster a learning process between the wineries and growers with regards the wines of the West Sonoma Coast. WSCV currently has no plans to pursue AVA designations for these six sub-regions. Warmer than the last four sub-regions listed here but the sub-region possesses less diurnal fluctuation with lower daytime temperatures and higher nighttime temperatures. The advantages of less diurnal swing has vintners drooling over the ability to pick grapes sooner at lower Brix while exhibiting full color, aroma and flavor development. Soils are well-drained but variable. 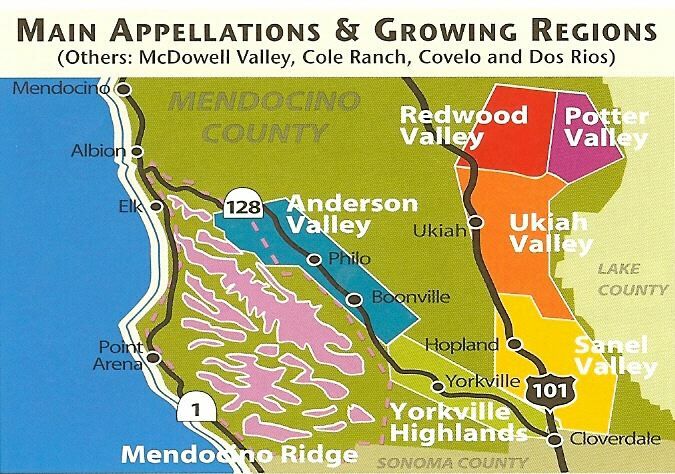 Well-known vineyards here include Blue Slide Ridge and Three Sisters (Martinelli), Boar's View (next to Marcassin), Camp Meeting Ridge (Flowers), Fort Ross Vineyard, Hellenthal, Hirsch, Marcassin, and Seaview (Peter Michael). 900 to 1,200 foot ridges west of the town of Occidental. Vineyards move farther inland in this sub-region. Narrow diurnal fluctuations in temperature are the rule. Well-known sites include Coastlands, Haven (Littorai), Jack Hill, Joy Road, Occidental, Occidental Ridge, Occidental Station, Seascape (Hartford Family Winery), Silver Eagle, Summa Vineyard (Rivers-Marie), Taylor Lane (Belle Glos) and B.A. Thieriot Vineyard. Vineyards are planted on rolling hills of 200 to 800 feet elevation south of Occidental. Vineyard sites are heavily influenced by fog which rolls in through the Petaluma Gap at Bodega Bay and the Salmon Creek corridor, resulting in many vineyards being the coldest in the West Sonoma Coast. The vineyards are further from the coast than those in Occidental. Wide temperature swings are not unusual. Balistreri, de Coelo Estate (Benziger), Kistler and Pastorale and Quarter Moon (Freestone Vineyards) are notable vineyards. East of Freestone, this sub-region is the southernmost part of the Russian River Valley, added to the Russian River Valley AVA in 2005. The climate is cold with heavy fog intrusions from the adjacent Petaluma Gap although the more northern plantings are protected from the wind and fog that enters through the Gap. Soils are primarily Goldridge. According to John Winthrop Haeger, “Sebastopol Hills is a roughly triangular chunk of land consisting most of northeast and southwest oriented ridges on the lee side of a transverse ridge that separates the Russian River Valley from the Petaluma Gap. 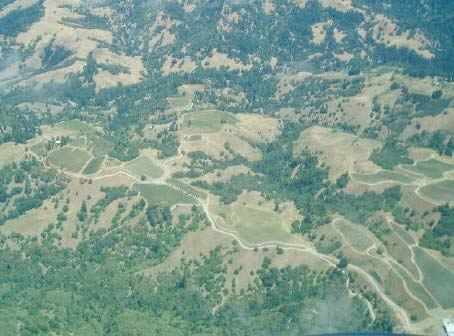 It is also the main watershed for Arastradero Creek.” Noted vineyards include Burnside Road, DuNah, Freestone Hill (Dutton-Goldfield), Halleck Estate, Kanzler, Maboroshi, Meredith Estate (Merry Edwards), Pillow Rd., Pratt, Suacci-Carciere, Peters, Pivot (Littorai), Rayhill (Chasseur), and Umino. Currently known officially as the “Green Valley of Russian River Valley,” the small Green Valley AVA was approved in 1983 based on a submission by Joy and Barry Sterling, proprietors of Iron Horse Vineyards. Green Valley is the first place where maritime fog enters the Russian River Valley through the Petaluma Gap and the last place it burns off. As a result, Green Valley is substantially chillier than the remainder of the Russian River Valley. A 25 degree diurnal temperature swing is common. The predominant soil type is Goldridge sandy loam with a second less common type, Franciscan, also possessing good drainage. Vineyards to look for include Arrendell (Hartford Family Winery), Cresta Ridge (Thomas George Estates), Don Miguel (Marimar Estate), Dutton Widdoes, Dutton Hallberg and Dutton Sanchietti, Fog Dance (Hartford Family Winery), Graham Family, Hawk Hill, Heintz, and Keefer Ranch. 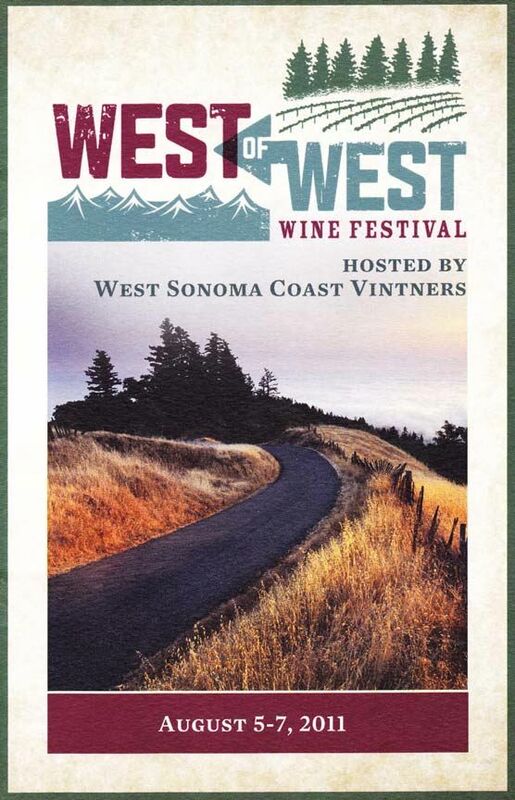 WSCV held their inaugural West of West Wine Festival in Occidental the weekend of August 5-7, 2011. Participating wineries included Anthill Farms Winery, Baker Lane Vineyards, Benovia Winery, Bohème Wines, Ceritas Wines, Chasseur Wines, Cobb Wines, Evening Land Vineyards, Failla Wines, Flowers Vineyard & Winery, Fort Ross Vineyards & Winery, Freeman Vineyards, Freestone Vineyards, Hartford Family Winery, Hirsch Vineyards, Lioco, Littorai, Marimar Estate Vineyards and Winery, Martinelli Winery, Patz & Hall, Peay Vineyards, Ramey Wine Cellars, Red Car Wine Company, Small Vines Wines, and Sojourn Cellars. Winemaker welcome dinners were held Friday evening, August 5, at various locations. These intimate dinners for small groups offered way too much great wine and a number of attendees could not manage to rise for the morning seminars on Saturday. Too bad, for the first seminar featured Burt Williams, the former winemaker at Williams Selyem and Ted Lemon, the proprietor and winemaker at Littorai. Because Williams Selyem started in 1981 in the Russian River Valley and many of the winery’s most famous vineyard sources were in the Russian River Valley (Rochioli Vineyard, Allen Vineyard, Olivet Lane Vineyard), Williams and the Russian River Valley are inevitably linked. However, Williams was the first prominent winemaker to recognize the potential of the West Sonoma Coast. In 1980 and 1981, Williams sourced grapes from Iron Horse and from 1982 to 1986 from Dutton’s Arrendell Vineyard, both in Green Valley. William Selyem’s first venture into the chilly Occidental area came in 1988 when he obtained fruit from the Summa Vineyard. Summa Vineyard was in a very marginal location buffeted by wine and consumed by fog, often suffering poor fruit set, but produced very dense, complex wines when nature cooperated. The 1991 Williams Selyem Summa Vineyard Pinot Noir was the first California Pinot Noir to sell for $100. The price reflected the tiny yields of 1/2 ton per acre of fruit which produced two new barrels of wine. A total of 1 ton of usable grapes was harvested from 4 acres which worked out to a price of $5,000 per ton when you consider the farming costs for three years, from two of which (1989 and 1990), no usable grapes were harvested. This was a ridiculously high sum for Pinot Noir grapes back then. Williams figured that if people wouldn’t buy it, he and Ed Selyem would take it all home and drink it. As Williams said, “C-note or c-none.” The wine sold out in three days. Hirsch Vineyard (1994) Coastlands Vineyard (1994) and Precious Mountain Vineyard (1996) would follow. The eventual notoriety of wines from these vineyards led many others to pursue plantings in the West Sonoma Coast. Ted Lemon was also an early proponent of the West Sonoma Coast. Before founding Littorai in 1993, he spent a summer with his wife Heidi exploring the Pacific Coast tasting local wines and learning about the soil and history of the local vineyards. Lemon had a firm belief in terroir inspired by his years in France. According to Lemon, “I believe soil is of major importance in a wine’s character. It’s clear there are tremendous differences between wines made from vineyards right next to each other even if they are vinified and treated exactly the same way.” Lemon finally settled on sourcing grapes from vineyards in western Sonoma and western Mendocino counties. He believed that the finest Pinot Noir and Chardonnay were grown along the true coastal zone of the continent and was convinced that the geology and mesoclimates of the extreme western portion of the continent north of San Francisco were diverse enough to create a series of unique terroirs, each with its own distinctive characteristics. He named his winery Littorai, a pleural noun formed from the Latin word “litor,” which means “the coasts.” He eventually sourced grapes from Hirsch Vineyard (1994), Heintz Vineyard, Summa Vineyard, B.A. Thieriot Vineyard, Pratt Vineyard and The Haven Vineyard, all located on the West Sonoma Coast. Lemon interviewed Williams during this morning seminar and each presented older vintages of their wines to sample. Williams offered the 1996 Williams Selyem Riverblock Russian River Valley Pinot Noir and the 1996 Williams Selyem Coastlands Vineyard Pinot Noir. Lemon shared his 1999 Littorai Theiriot Vineyard Sonoma Coast Pinot Noir and 2001 Littorai Hirsch Vineyard Sonoma Coast Pinot Noir. These wines had aged beautifully and Williams was to remark, “If the wine is balanced ... if you pick the fruit before it’s really ripe ... I know Sonoma Coast Pinot Noir can age.” View the video: www.youtube.com/watch?v=4anSnLmnn20. dried), but never used more than 50%. vineyard differences would shine through without compensation or augmentation. great. No word yet about how the wines will be sold, but they will definitely be expensive. The West of West Wine Festival continued on Saturday with a walk-around tasting of wines from participating wineries capped off in the evening by a “Feast by the Prince & Princess of Pork” held at the Union Hotel Restaurant Ball Room. Open houses and barrel tastings were held throughout Sonoma County by members of WSCV on Sunday. The event was quite a success and its laid back, low key theme was appealing to those in attendance. Stuffy just doesn't work in Occidental. For more information and to join the WSCV mailing list visit www.westsonomacoast.com. “Sonoma Extreme,” Randy Caparoso, Sommelier Journal, January 31, 2011 (Part 1) and March 10, 2011 (Part 2). 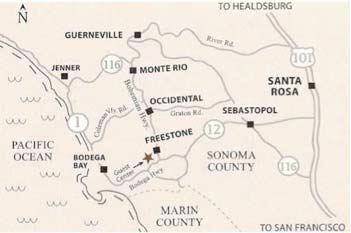 “Pedaling the Coast - a terroir ride through western Sonoma,” David Darlington, Wine & Spirits, August 2011. “The True Sonoma Coast - Cool-climate winemaking in California,” Jonathan Swinchatt, The World of Fine Wine, Issue 17, 2007. “Pinot Noir’s Promised Land - America’s most Burgundian Pinot Noirs are born amid the epic landscape of the far Sonoma Coast,” Richard Nalley, ForbesLife Magazine, www.forbes.com, March 15, 2010. North American Pinot Noir, John Winthrop Haeger, University of California Press, 2004. For current articles published on the Sonoma Coast, visit this internet site: www.daylife.com/topic/sonoma_coast/overview/3?_site=daylife. I highly recommend the wines below from the West Sonoma Coast (all tasted in 2010 and 2011). One side note: the horrendous forest fires in 2008 led to smoke taint in many Pinot Noirs from the Sonoma Coast. For this reason, choose carefully among the West Sonoma Coast wines that made it to the marketplace from the 2008 vintage. 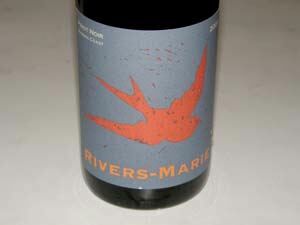 This year I tasted the Rivers-Marie 2009 Pinot Noir lineup three times: once with winemaker Thomas Rivers Brown, once earlier this year, and again recently. 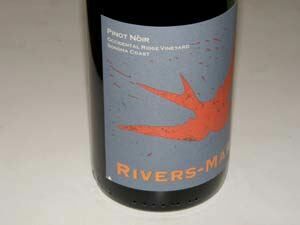 Rivers-Marie has become one of the most sought after Pinot Noirs made in California. Production is always small but was unusually limited in 2009 and the day the wines were offered, all but the Sonoma Coast appellation Pinot Noir were sold out within a few hours. Little did most eager buyers know that all the wine from the younger vines of Summa Vineyard was added to the Sonoma Coast bottling and not bottled separately as a vineyard designate as is the usual rule (there was a Summa Old Vines Pinot Noir in 2009). The Sonoma Coast Pinot Noir was a steal at $25. Thomas Rivers Brown and spouse Genevieve Marie Welsh became the second owners of the Summa Vineyard in September, 2010, when they bought the vineyard from the Zeller family who still farm this beautiful site on Taylor Lane in the West Sonoma Coast. The original vines were planted in 1980 (1978 also sited) by Taylor Lan. The Zellers will not disclose the clone(s) planted here, even to new owner Brown. In 1998, interplanting and additional plantings on resistant rootstock added to the vineyard. The acquisition of this vineyard has great meaning for the Browns, whose winery was launched in 2002 when Summa Vineyard owner Scott Zeller offered Brown some fruit from his vineyard. Later, Zeller also was able to introduce Brown to other nearby Occidental vineyard owners which led to further Rivers-Marie grape sources. Summa Vineyard was the source of a vineyard designated bottling by Williams Selyem beginning in 1988, but discontinued when the winery was sold in 1997. The 1988 Williams Selyem Summa Vineyard Pinot Noir inspired many California winemakers including Brown who has said, “I had never tasted anything like that before from California.” For a few vintages in the late 1990s and 2000 Mueller Winery made wine from this vineyard. Brogan Cellars produced wine from Summa Vineyard after the sale of Williams Selyem Winery. Littorai has also been a buyer of Summa Vineyard fruit. With the sale of the vineyard, Brown will probably keep all of the small production from Summa Vineyard for himself. Brown felt that the 2009 Summa Vineyard young vines Pinot Noir lacked character and all of it was added to the Sonoma Coast bottling as I noted above. The other 2009 wines are considered by Brown to be the best since 2005 for his style of Pinot Noir. He says, “They are the most intensely focused, varietally pure set of wines we have ever made. We’ve also never seen the individual bottlings differ from one another so greatly. Though all the vineyards that contribute to the 2009s are within two miles of each other, each wine shows a decidedly distinct personality." For me, the 2009 wines are not quite up to the very high standard I have come to expect from Rivers-Marie, but that is only because recent vintages have been so spectacular. The wines were tasted 6 months apart in bottle and my impressions were consistent. Newer vineyard sources are becoming available to Brown including Lancel Creek Vineyard and UV Vineyard, both farmed by Ulises Valdez, Silver Eagle Vineyard, and all the planted Chardonnay in the B.A.Thieriot Vineyard. As a result, more wine will become available in 2010 with new vineyard designates and more Sonoma Coast Pinot Noir although the established single vineyard bottlings remain about the same ( a total of about 1,800 cases for the vintage). Production will never be large, however, as this is simply a personal project for Thomas and Genevieve. Brown’s other job keeps him busy enough, as he is making wine for multiple other wineries from his base at the Outpost Winery in Angwin (primarily Cabernet Sauvignon). The fact that he is famous for so many high scoring Cabernets, wine lovers expect his Pinot Noirs to be styled in the same fashion. That is simply not the case and the Rivers-Marie Pinot Noirs display plenty of charm and elegance typical of wines made from this grape. 13.9% alc., 279 cases, $25. A 12 barrel blend composed roughly of 50% Summa Vineyard (declassified), 25% Willow Creek Vineyard and 25% Lancel Creek Vineyard. Aged in 33% new French oak barrels. · Moderate reddish-purple color in the glass. Aromas of ripe strawberries, dried rose petals and smoky oak. Redder fruits are featured in a slightly terse, almost steely wine with supple tannins, finishing with an acidic tang of grapefruit peel. An excellent wine for the dinner table. Good. 13.5% alc., 133 cases, $45. 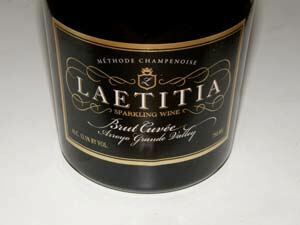 Aged in 33% new French oak barrels.The grape berries were exceptionally small in 2009, composed of only skin and seed. · The resulting juice was dark purple. Dark black plum color in the glass. Aromas of blackberries, dark stone fruits, oak spice and slight reduction. Richly fruited with intense flavors of grilled black fruits, cassis and an underlying savory note. Bright acidity, soft tannins and a smooth mouth feel add to the appeal. 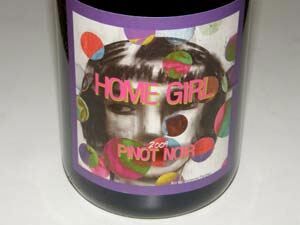 This Pinot has as enough acidity to balance out the bold fruit. Very good. 14.2% alc., 86 cases, $45. Aged in 50% new French oak barrels. Made with reduction so locked down since bottling. · Moderate reddish-purple color in the glass. Reduction upon opening with a heavy scent of oak-derived coffee. Medium-weighted flavors of black cherries and dark red berries with smoky oak and coffee notes in the background. Impressive elegance and softness with a bright lift of acidity on the finish. Decanting recommended. Good (+). 13.2% alc., 106 cases, $60. Aged in 80% new French oak barrels. · Moderate reddish-purple color in the glass. An enticing and aromatically exotic nose featuring mixed berries and black cherries with a hint of toasty oak. Clearly the most intoxicating perfume in the lineup. Smooth and polished on the palate with ripe flavors of red plums and cranberries with an underpinning of savory herbs and oak. Similar to the Sonoma Coast bottling in its flavor profile, but with more body, flavor, mid-palate impression and nuance. A delicious wine that has the balance to age extremely well. There is really nothing else quite like a Pinot Noir from these old vines in the Summa Vineyard. This summer, Rivers-Marie is offering the first ever releases of single vineyard Cabernet Sauvignons along with the traditional Napa Valley blend. The two new wines are from Roberto Corona Vineyard up Oakville Grade and Panek Vineyard in St. Helena. Each bottling is less than 150 cases. A Chardonnay from B.A. 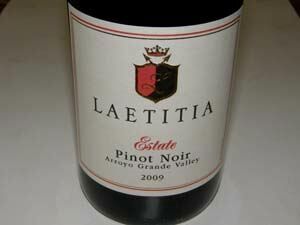 Thieriot Vineyard is also offered in 2009 (previously reviewed). Visit www.riversmarie.com to join the mailing list. The winery is not open to the public. James MacPhail began to produce Pinot Noir from North Coast appellations beginning in 2002 under the MacPhail Family Wines label. A native son of Marin County in a family with roots in the area dating to the 1880s, his background includes a broad range of interests including dairy farming near Tomales Bay and ventures into appliance retail, building materials and natural gas. He became an accomplished classical pianist and bagpiper. In 1983, MacPhail was the youngest to swim across the Golden Gate and remains a nationally ranked Masters Class competitive swimmer. MacPhail developed his winemaking skills at Quivera, Pellegrini and Merry Edwards, and quickly focused on Pinot Noir. After making wine in rented space for six vintages, he built a 5,000 case winery and tasting room in Healdsburg in 2008 where he crafts about 4,000 cases annually of Pinot Noir sourced from the Sonoma Coast and Anderson Valley. 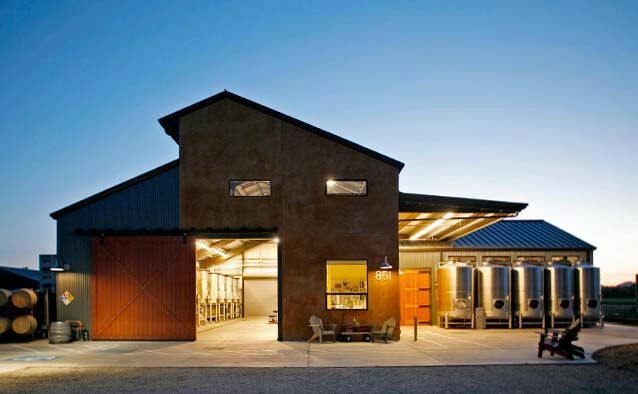 The winery has a rural barn aesthetic and employs passive solar design and daylighting as well as a waste water wetland system for production waste to cleanse waste water that can later be used for irrigation. In 2007, MacPhail became the winemaker for Sequana Vineyards. These wines are crafted in much the same style as MacPhail Family wines but the focus is on sourcing grapes primarily from the Green Valley of Russian River Valley and the Santa Lucia Highlands. Production at Sequana Vineyards is 11,000 cases per year. Recently, MacPhail joined The Hess Collection bringing along MacPhail Family Wines while continuing his work as the founding winemaker for Sequana Vineyards. The Hess Collection has acquired the MacPhail Family Wines brand as well as existing inventory. 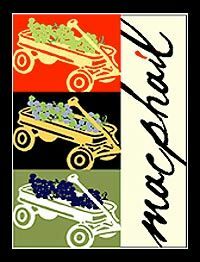 The colorful wine label of MacPhail Family Wines features a Radio Flyer wagon filled with grapes. This along with the winery’s marketing program are very eye-catching, attracting my interest initially several years ago. Early on, I found the wines a little hit and miss and stylistically they were often a bit generous in alcohol, ripe and oaky. The wines did improve in the bottle over time because of bright acidity. Recently I had the opportunity to taste the 2009 vintage Pinot Noirs from MacPhail and I came away with renewed interest and a more favorable impression. Oak still plays a role in the wines but is more restrained and complimentary, and the wines all show admirable balance. 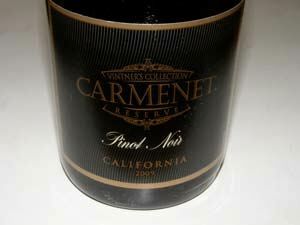 The 2009 Pinot Noirs are all quite approachable now, although the vineyard designated Pinot Noirs will benefit from more time in the bottle. I think the wines will appeal to every Pinot Noir lover. The winemaking regimen is as follows: grapes are hand picked and hand sorted, 100% de-stemmed and undergo a 5-day pre-fermentation cold soak. Fermentation is begun with indigenous yeast and then inoculated. Native malolactic fermentation occurs in barrel. Batonnage is performed weekly for 3 months. The wines are aged 11 months in 40% to 100% new French oak barrels and bottled unfined and unfiltered. All the 2009 wines reviewed here were released in the fall of 2010 except the Wightman House and Vagon Rouge which are scheduled for fall release in 2011 (the Home Girl Pinot Noir is a spring release). MacPhail Family Wines is open for tasting by invitation and appointment only and usually MacPhail makes himself available for these tasting sessions. 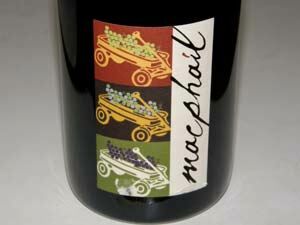 Visit the website at www.macphailwine.com. 14.3% alc., pH 3.67, TA 0.57, 135 cases, $29. A blend of all (10) single vineyards sourced by MacPhail. Approximately one foot of wine at the bottom of each bottling tank was moved back to barrels (40% new) and aged for another five months, then bottled unfined and unfiltered. · Moderate reddish-purple color in the glass. Rather flat nose offering dark red cherry, baking spice and leaf aromas. Cherry-driven, slightly candied flavor with some oak showing up on the finish. A lighter styled wine with fine-grain tannins, a bright texture, and bright acidity on the finish. Drink now. Decent. 14.3% alc., ph 3.60, TA 0.63, 1,195 cases, $39. Sangiacomo, Pratt, Wildcat and Gap’s Crown vineyards. Multiple clones including Dijon 113, 114, 115, 667 and 777, Pommard, 2A, 9 and 23. Aged 11 months in 40% new and 60% 1 and 2-year-old French oak barrels. · Moderately dark reddish-purple color in the glass. Nuanced aromatic profile featuring scents of strawberries, black cherries, savory herbs and old wood. 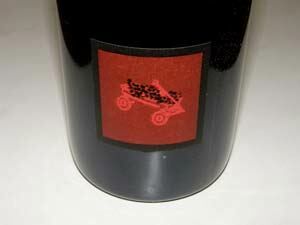 Medium-weighted core of earthy dark red fruits possessing a wild, exotic flavor and a slight green undertone. There is a fine dusting of tannins and adequate acidity. A solid wine that is nicely crafted, but doesn’t excite. Good. 14.3% alc., pH 3.45, TA 0.65, 320 cases, $49. This vineyard is in the Petaluma Gap region of the Sonoma Coast. Clones 115, 667 and 777. Aged 11 months in 40% new and 60% 1 and 2-year-old French oak barrels. · Moderately dark reddish-purple color in the glass. The aloof nose features demure scents of dark stone fruits and smoky oak. In the mouth, the juicy dark plum, blackberry and black raspberry fruit comes alive accented by underpinnings of anise, ash and complimentary oak. The nicely ripened fruit is robed in gossamer tannins and the wine finishes with modest length. Good. 14.3% alc., pH 3.82, TA 0.56, 178 cases, $49. Clones 667 (33%) and Pommard (67%). Harvested at 27.5º Brix. Aged 11 months in 50% new and 50% 1 and 2-year-old French oak barrels. · Moderate reddish-purple hue in the glass. Aromatically shy initially, but opens nicely over time in the glass to offer scents of black cherry pie, red plums, sandalwood and underbrush. Very polished in the mouth with impressive mid-palate intensity of delicious black cherry, strawberry and raspberry spicy fruit wrapped in fine sweet tannins. A wine of impressive breeding and balance. This clonal mix always seems to delight me. 14.3% alc., pH 3.86, TA 0.54, $49. Clones 115 (30%), 667 (30%), 777 (30%) and 2A. Aged 11 months in 60% new and 40% 1 and 2-year-old French oak barrels. · Initially, oak-derived aroma of coffee predominates, fading over time with the emergence of shy black cherry fruit and a little barnyard. Tasty core of red fruits enhanced with notes of spice, sandalwood and oak with a slight coffee accent. Crisp with lively acidity. Good. 14.3% alc., pH 3.94, TA0.55, 66 cases, $55. 100% Martini clone. Aged 11 months in 66% new French oak barrels. · Moderately dark reddish-purple color in the glass. An enticing and thoroughly seductive wine that offers an hi-tone perfume of dark berry jam, spice, vanilla and the slightest oak. Discreetly concentrated, earth-kissed flavors of blackberry and plum sauce with a hint of tar and oak. The texture is dreamy soft. Finishes dry with impressive persistence. Very little Martini clone is planted in the Anderson Valley so this is a very distinctive wine representing an impressive expression of this clone that will hold the interest of any serious Pinot Noir connoisseur. 14.3% alc., pH 3.73, TA 0.57, 117 cases, $59. 5 hand-selected barrels. Sourced from Toulouse, Wightman House, Frattey Shams, Raye’s Hill and Ferrington vineyards. Aged 11 months in 100% new Tonnellerie Ermitage Medium Toast French oak barrels. · Moderately intense color in the glass. Shy nose offering aromas of cherry crisp, spice, briar and subtle oak. Soft and smooth on the palate with satisfying flavors of red cherries, cardamon spice, and sandalwood enrobed in firm fine-grain tannins. Nicely composed with oak playing a complimentary supporting role. Picks up interest over time in the glass and is even better the following day from a previously opened and re-corked bottle. Keep this one under wraps for a couple of years and then plan a special dinner around it. Very Good (+). 14.9% alc., 400 cases. Clones 2A, 777, 667 and 115. Native fermentations. Aged 11 months in French oak barrels. Unfined and unfiltered. · Moderate reddish-purple hue in the glass. Very alluring nose offering scents of black cherries, dark berry compote, brioche, cola, vanilla and subtle oak. Medium-weight flavors of black cherries, raspberries and cranberries finishing with zingy citrus and oak in the background. Tannins have softened and the mouthfeel is all silk and satin. Good (+). Winemaker Jeff Stewart Joins Hartford Family Winery Jeff Stewart, who did a remarkable job resurrecting the quality of wine produced at previously moribund Buena Vista Carneros, has been appointed winemaker and general manager at noted Russian River Valley Pinot Noir producer, Hartford Family Winery. Stewart left Buena Vista Carneros after it was recently acquired by Boisset. Gilt Taste Offers High-End wines Gilt Group, the owner of the luxury travel site Jetsetter, has launched the beta version of Gilt Taste, a food-centric site that is offering hard to find, well-reviewed wines mainly from France and California. They recently offered several selections from Sonoma’s Freeman Winery. The 2008 Bryant Family Cabernet was also available, a wine impossible to buy period. Wines currently for sale range from $12 to $500, with the majority in the $40 to $120 range. The site features expert reviews, sales of carefully selected wines and flash sales similar to those on their travel site. The editorial content comes from big name food and wine writers and sommeliers. You can sign up to receive the flash sales offerings at www.gilttaste.com. Wine Bonds Collin Walter of Park Point Capital is a Sonoma local and avid supporter of Sonoma wines. He is currently assisting a few wineries on a platform for attracting new customers and financing their business. Walter grew up in Sonoma, studied economics at Duke, and spent his postgraduate career in investment banking and private equity. His new financing and marketing vehicle (‘wine bond’) allows wineries to pay investors with cases of wine and exclusive perks in place of cash interest payments. The investors provide the winery with capital of a predetermined duration (e.g. $20K each for 5 years) and in return, the winery compensates the investors with goods (e.g. specially marked bottles of wine) and services (e.g. special events, activities and estate privileges). Relationships with customers are strengthened as they take a more active role in the operations of the winery. Increased sales are anticipated resulting from the initial publicity and word-of-mouth recommendations of loyal investors. Regardless of a winery’s current cost of debt, ‘wine bonds’ can cut annual cash interest payments by more than half. For example, on a $25mm offering, a winery could eliminate $3mm in cash interest payments. For more information, contact Collin Walter at cwalter@parkpointcapital.com. eatdrink Launched Wine expert Paul Wasserman, son of legendary wine broker Becky Wasserman, has founded an online gifting company offering unusual “things for foodies and winos” that include inspired paraphernalia and limited edition books. The first limited edition book is G.B. Stern’s Bouquet, the recounting of two couples’ 1926 jaunt through the wine regions of France. The book will be released in a cloth bound, silk screened, hard cover limited edition of 950 copies. The site will also be releasing Dr. Lavalle’s Historie et Statistiques de la Vigne et des Grand Vins de la Côte d’Or (History and Statistical Study Of The Vineyards and The Grreat Wines of the Côte-d’Or) in both a French facsimile and an English translation. First published in 1855, this remains one of the most important books ever written about the wines of Burgundy. For further information about the books or eatdrink visit www.eatdrink.co. Boisset Plans Changes At Buena Vista Carneros Boisset Family Estates has purchased the Buena Vista brand and the old stone winery as well as negotiating a long-term lease on Buena Vista’s extensive Carneros vineyards. Jean-Charles Boisset plans to launch new varietals for the winery including Zinfandel and Cabernet Sauvignon, add unusual varietals from Sonoma County vineyards, incorporate a line of high-end wines, and produce a sparkling wine named after Count Agoston Haraszthy’s Mèthode Champenoise wine, Eclipse. David Ramey has been hired as consulting winemaker to direct the roughly 42,000 case production. No changes are planned for the tasting room located in the historic 1857 winery. Boisset Family Estates currently own Amberhill Wines, California Rabbit, DeLoach Vineyards, Fog Mountain, Lyeth Estate, Raymond Vineyards, Sonoma Cuvée and JCB by Jean-Charles Boisset. Chicago Wine School New Book Patrick W. Fegan is the Director of Chicago Wine School which is publishing a new book titled, “The Vineyard Handbook; Appellations, Maps & Statistics.” The book includes a 30-year evolutionary look at the grape producing nations of the world, a list of the “Top Grape Varieties” planted, and maps which contain acreage and production figures, indications of appellations, and major grape varieties planted in each region. The book is highly specialized and suitable only for the most serious wine geeks. Visit www.wineschool.com for further information and to purchase. The current 2nd Edition is being closed out in preparation for the 3rd Edition so if you want the latest edition be sure to inquire first before purchasing. 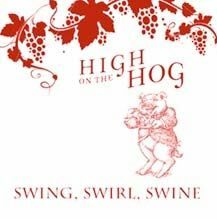 High On the Hog Event On Saturday, September 10, 2011, a tasting of Pinot Noir from noted California producers Au Bon Climat, Calera, Cobb, Claypool Cellars, Freeman, Goldeneye, Hartford Court, Kutch, Miura and Peay will be held at Epic Roadhouse Restaurant in San Francisco. Sommelier Raj Parr will be signing copies of his co-authored book Secrets of a Sommelier. Chef Jason Birnbaum will be on the grill. Music provided by Back Burner Blues Band. Tickets are $75 per person and available online at www.epicroasthouse.com/epic_ticket.php. Pinot In The City Two days of Willamette Valley wines, winemakers and food purveyors in the heart of the Pearl in Portland on Saturday and Sunday, September 10-11, 2011. More than 100 of Willamette Valley’s wineries will come to Portland and converge on one city block. Delicious bites from restaurants including 1910 Main: An American Bistro, Community Plate, Crooked House Bistro, Dundee Bistro, Jory (Allison Inn & Spa), La Rambla, Red Hills Provincial Dining, and Subterra. Meet acclaimed authors Katherine Cole, Cole Danehower and Janis Miglavs. Get the dirt on how different soils in the Willamette Valley produce distinctive wines. Sponsored by Willamette Valley Wineries (www.willamettewines.com). Tickets are $60 for one day and $90 for two days (not all the same wineries will be pouring each day). Alta Maria Vineyards Tasting Room On August 19-21, 2011, Alta Maria Vineyards opened their first tasting room in Los Olivos. Besides the well-known Alta Maria Pinot Noir, the winery is offering a Chardonnay, a steel tank fermented Sauvignon Blanc and a 58 month barrel-aged Cabernet Sauvignon. In addition, limited release wines from James Ontiveros’ Native9 and Paul Wilkins’ Autonom brands will be available on a limited basis for tasting. The location is 2933 Grand Avenue, Suite A, Los Olivos. 805-686-1144. Eight Tasting Rooms in Newberg Newer tasting rooms have opened within the city limits of Newberg, Oregon in the heart of the Willamette Valley bringing the current total to eight. The tasting rooms include Anam Cara Cellars (306 N. Main St., open daily), Artisanal Wine Cellars (614 E. First St., open daily), Chehalem Tasting Room (106 S. Center, open daily), Dark Horse Wine Bar (1505 Portland Road, Medici Vineyards, Sineann Winery and Ferraro Cellars, open Thursday-Sunday during the summer), Fox Farm Vineyards (open daily, several small producers are available as well), Hip Chicks Do Wine (6028 E. First St., open daily), Longplay Vineyards (215 E. First St., open Thursday-Sunday) and Spangler Vineyards (203 Villa Road, open Weds-Sunday). Generally the tasting rooms are open from 11:00 AM to 5:00 PM. Mendocino is America’s Greenest Wine Region Nearly 80 wineries in Mendocino County are scattered from the coast to high mountain valleys with most concentrated in Mendocino’s southern valleys. The county is home to the first certified organic winery in the country and many Mendocino wineries rely on solar power, organic farming, and other earth-friendly practices. Can you name the 11 smaller AVAs within the broad Mendocino AVA? They are Anderson Valley, Cole Ranch (the Sterling family owns all 60 acres), Covelo (America’s smallest AVA located in the far north of the county with no wineries and only 2 acres of grapevines), Dos Rios (a single winery and 6 acres of wine grapes), McDowell Valley (540 acres east of the Russian River in Hopland), Mendocino Ridge (the only non contiguous AVA in the U.S. covering more than 400 square miles, but only includes areas above 1,200 feet in elevation; a very promising new region for Pinot Noir and Chardonnay), Potter Valley (more than 1,000 acres of vineyards but no wineries), Redwood Valley (site of the County’s first vineyards), Sanel Valley, Ukiah Valley (home to 12 wineries and vineyards), and Yorkville Highlands (runs south from Boonville to the county border along Highway 128). Two companies offer chauffeured visits to the region: Mendocino Wine Tours (www.MendocinoWineTours.com) and Mendo Wine Tours (www.MendoWineTours.com). CDC Study Recognizes Value of Moderate Alcohol Consumption A new study by the Federal Centers for Disease Control and Prevention confirms that moderate alcohol consumption is one of four healthy lifestyle behaviors that help people live longer. The four lifestyle behaviors are having never smoked, eating a healthy diet, getting regular physical activity and moderate alcohol consumption. Each is associated with a significant beneficial effect on mortality. The study was recently published online in the American Journal of Public Health. Researchers analyzed data from 16,958 participants in the National Health and Nutrition Examination Survey III Mortality Study from 1988 to 2006. The researchers found that each lifestyle behavior was significant in reducing mortality but the greatest benefit was when moderate alcohol consumption was included with the other three lifestyle behaviors. The study authors pointed to the recommendations of the Federal 2010 Dietary Guidelines for Americans, which defines moderate drinking as consuming up to one drink a day for women and two drinks a day for men. The Guidelines define a standard drink as 5 fluid ounces of 12% alcohol wine. (0.6 fluid ounces of alcohol). The researchers also cited the well-documented harm caused by excessive alcohol use. 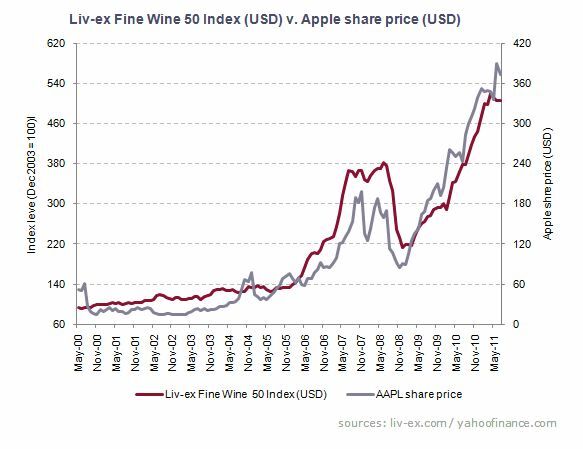 From liv-ex.com, The Fine Wine Exchange, a leading market place for the fine wine trade. The graph above speaks for itself.